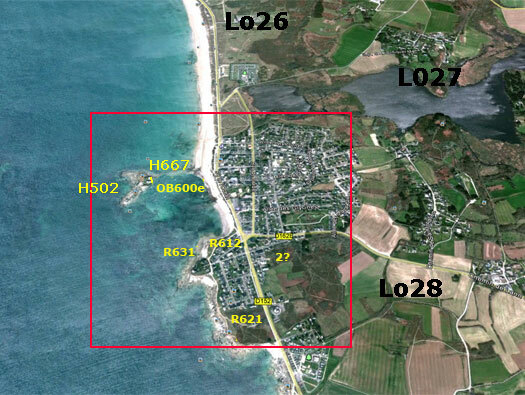 Lo28 Le Fort Bloque is situated on the D152 west out of Lorient along the coast. 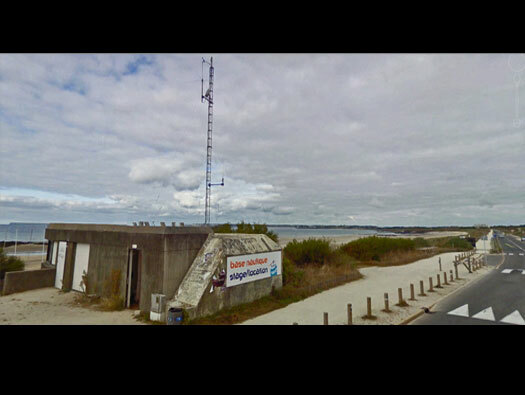 R637 Measuring post for an army (Heers) coastal battery. 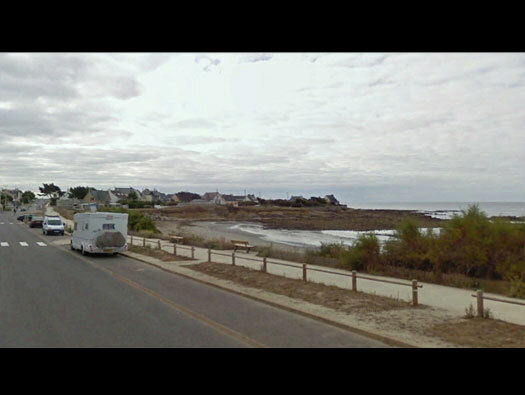 This was or still is sitting on the pointe looking out to sea. Ringstand OB600e & H667 Casemate for 5cm KwK guns. 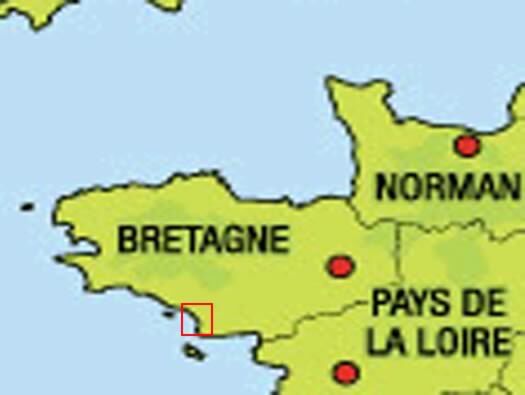 Red circle - OB600e. Yellow circle -R667. First there was only the OB600e open emplacement with a 5cm KwK gun in place. 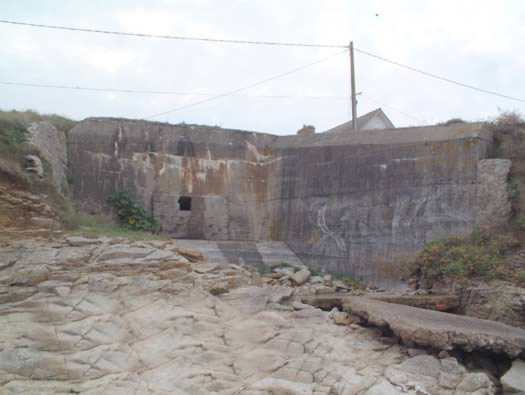 Then as casemates started to replace open emplacements an R667 was placed in the front. 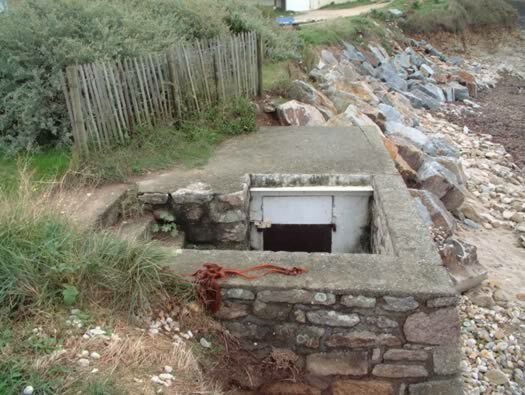 The gun may have been removed from the open emplacement and placed into the H667 or both open & the casemate were used? OB600e open emplacement for a 5cm KwK gun..
A 5cm KwK fits well in here and behind the R667 has been superimposed in front of this emplacement. Hidden behind a nice bush. 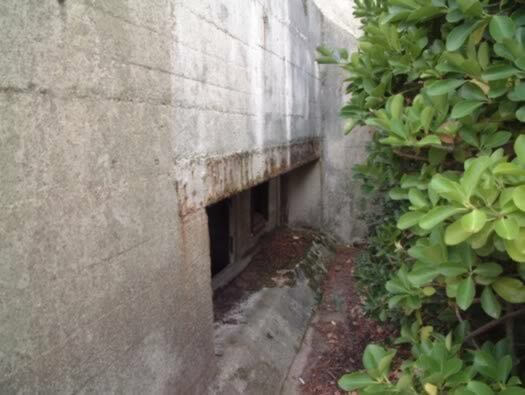 Rear entrance into an R667 casemate. 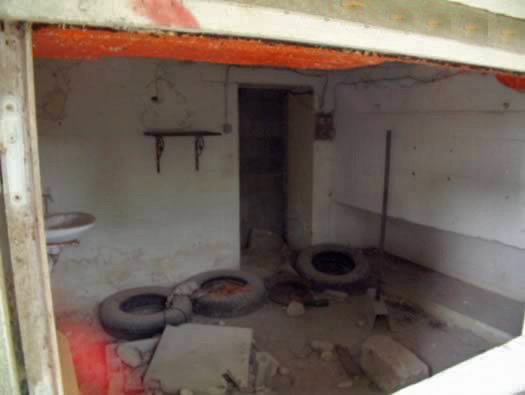 The gun room with its own sink? The slot on the right was for the spare ammunition. The gun bolted down onto the floor in the centre. 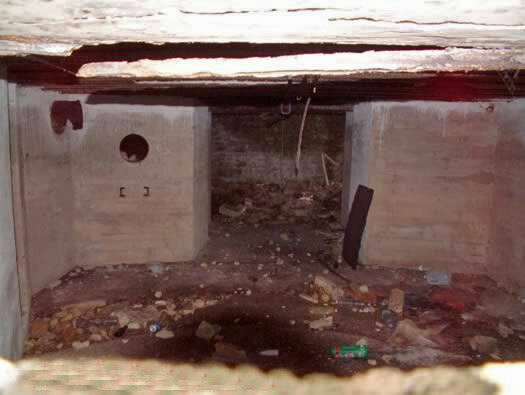 After the war a public toilet was placed into the gun room, since then a new toilet has been placed in the rear area. A rear entrance in an R667 at Granville with a different smell. The view down the beach covered by this gun and before the open ringstand. Continue down this road to Lo26. 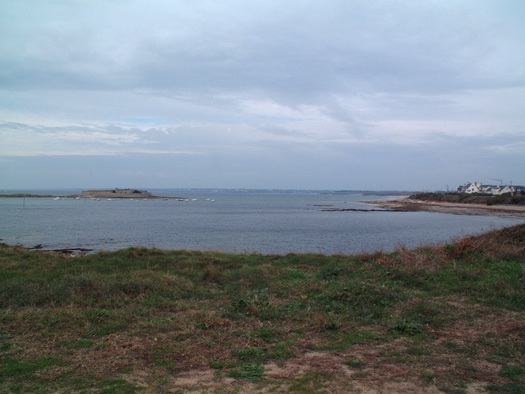 Now looking east at the headland. 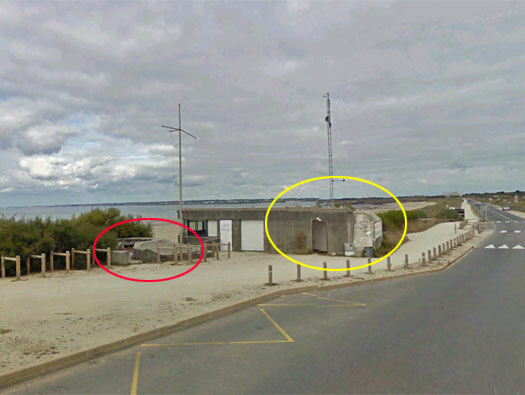 Here is an R612 casemate, a small Vf bunker and an R631 casemate. 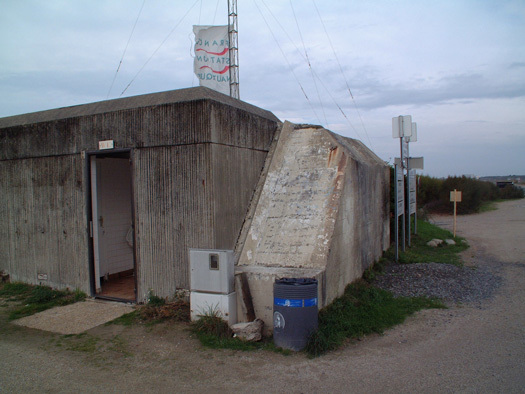 R612 casemate for a field cannon. Many guns were used in the German artillery and they all had different ammunition. Causing a real problem with supply. The gun room with extractor fan fittings on the left and the two ammunition storage areas either side. Made locally probably by the soldiers here. R631 casemate for a fortress anti-tank gun a 4.7cm Skoda(t) gun. Gun room, crew room, ammunition room and a close combat room to cover the rear door. Gun crew with the gun commander looking through a small slit in the metal plate and the gunner sitting on a seat attached to the gun ready to shoot it. The view of the old fort.